Inspired to make a difference to the lives of thousands of young people across the country, a team of employees from EMR, ‘Team Steel’ raised over £15,000 through sponsorship after completing MediaCityUK’s Urban Challenge, which was generously match-funded by EMR to raise a total of £33,778. As a special thank you to the staff at EMR, young people shared their individual Youth Zone experiences with the team and highlighted the difference that EMR’s support will make to young people. Whether it is a safe and fun place to meet up with new friends and try new activities or to receive mentoring, advice and guidance, each Youth Zone represents a second home to many young people. Speaking at the cheque presentation Youth Zone member Emily said: “The Youth Zone is my second home and the staff are my second family, thank you EMR for supporting OnSide Youth Zones and for making all of this possible”. Andrew Brady, EMR UK COO said: “At EMR we put a great deal of importance on supporting the communities that are close to our sites. “We were delighted to welcome young people from the OnSide Youth Zone network to our head office in Warrington to hear how Youth Zones have made a tremendous difference to their lives. 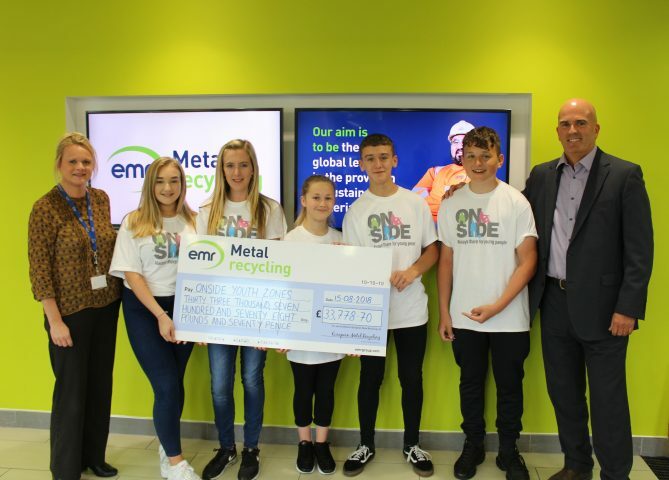 “As one of the world’s largest metal recycling companies, EMR is pleased to support OnSide Youth Zones as it expands into more towns and cities across the country, providing a safe and inspirational place where all young people can make productive use of their leisure time.